The purpose of Barrett’s surveillance programs is to assess the precursor lesion for the development of invasive adenocarcinoma and detect cancer as early as possible. Previous studies have demonstrated that the length of Barrett’s esophagus is an independent risk factor for the development of esophageal adenocarcinoma and that cancer is typically located at the distal portion of the Barrett’s esophagus. 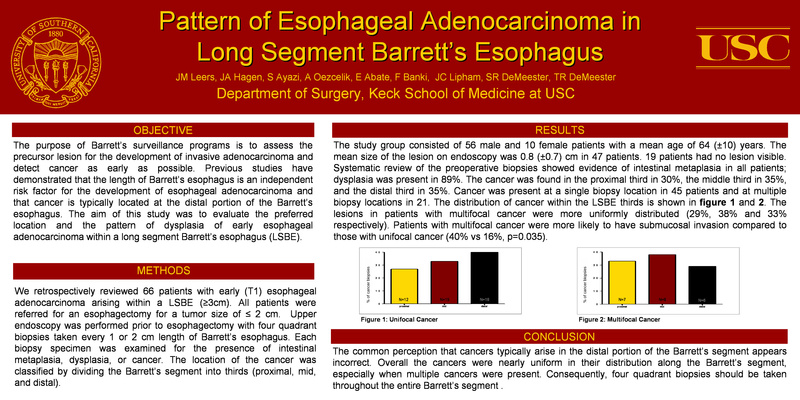 The aim of this study was to evaluate the preferred location and the pattern of dysplasia of early esophageal adenocarcinoma within a long segment Barrett’s esophagus (LSBE). We retrospectively reviewed 66 patients with early (T1) esophageal adenocarcinoma arising within a LSBE (at least 3 cm). All patients were referred for an esophagectomy for a tumor size of < or equal 2 cm. Upper endoscopy was performed prior to esophagectomy with four quadrant biopsies taken every 1 or 2 cm length of Barrett’s esophagus. Each biopsy specimen was examined for the presence of intestinal metaplasia, dysplasia, or cancer. The location of the cancer was classified by dividing the Barrett’s segment into thirds (proximal, mid, and distal). The study group consisted of 56 male and 10 female patients with a mean age of 64 (±10) years. The mean size of the lesion on endoscopy was 0.8 (±0.7) cm in 47 patients. 19 patients had no lesion visible. Systematic review of the preoperative biopsies showed evidence of intestinal metaplasia in all patients; dysplasia was present in 89.4%. Cancer was present at a single biopsy location in 45 patients and at multiple biopsy locations in 21. The cancer was found in the proximal third in 30%, the middle third in 35%, and the distal third in 35%. In patients with unifocal cancer the tumor was located in the proximal third in 27%, the middle third in 33%, and the distal third in 40%. The lesions in patients with multifocal cancer were more uniformly distributed (31.5%, 37% and 31.5% respectively). Patients with multifocal cancer were more likely to have submucosal invasion compared to those with unifocal cancer (40% vs 16%, p=0.035). The common perception that cancers typically arise in the distal portion of the Barrett’s segment appears incorrect. Overall the cancers were nearly uniform in their distribution along the Barrett’s segment, especially when multiple cancers were present. Consequently, four quadrant biopsies should be taken throughout the entire Barrett’s segment .